1/4 cup vegan cream cheese , like Tofutti, at room temperature. 1/2 cup or 8 tbsp vegan butter like Earth Balance , also at room temperature. In a bowl, sift together the flour, baking powder, baking soda and mix well. Add the cardamom powder and mix. Set aside. In another bowl, with a hand mixer or a stand mixer set to medium speed, cream the vegan butter and the sugar until light and fluffy, for no more than 2 minutes. Add the cream cheese and beat until just mixed. Do not overbeat. Add the flour mixture in three batches alternating with the soymilk, beating in well after each addition so there are no lumps. Scrape down the bowl after each addition. 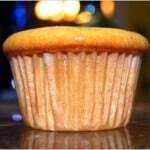 Line 10 cups of a standard-sized muffin pan with cupcake liners. Divide the batter equally among the cups, filling each cup about 2/3rds. Bake in a preheated 350-degree oven about 25-28 minutes until a toothpick inserted in the center comes out clean. Cool on a rack. Mava cakes are never frosted, so all you have to do now is eat it. Enjoy!